We held our yearly local fund raiser featuring the Bar J Wranglers from Jackson. What a talented, funny entertaining bunch! I visited with them one-on-one as they set up sound and equipment and enjoyed hearing some of their personal experiences. I called granddaughter, Andie, while I was on the stage listening to them warm up and she was so impressed with me! [I think] The event was well attended and the pre-auction successful. One picture from home-town-favorite, Jim Norton went for $4000! A beautiful oil with his signature Indians on horses walking through a stream and beautiful, magnificent mountains, foliage and trees in the background. Stunning. Today I’m heading to SLC to “babysit” for Tracy’s three youngest while she, Richard and Blythe attend a T.J. Ed Forum filled with educational, spiritual and motivating classes and then the yearly ball — which is a must go, must see! This is getting to be quite the adventure. The little ones with Grommer in the swimming pool, at the ice cream shop, at the movies, at the mall, at a park or the zoo, at the ice cream shop [again!] . . . This year Keziah is running a triathlon in American Fork, so part of Saturday will be spent there while she tries her little heart out! And I’m thinking, since we are driving right past Quilted Bear in Murray, a quick stop might be happening. Weight wise: 142.5 this morning. Worried about spending a weekend away from my food. Worried about those ice creams. Worried I’ll abandon my three-day old [fairly successful] plan. I was just getting on a r.o.l.l ! I so hate having three great days and then not being able to follow through for the weekend. But, got a p.l.a.n! Taking a small cooler with frozen fruit, yogurt, walnuts, eggs, and fresh veggies and fruits. I long for normal. I’m sure other normal people don’t panic about a Friday through Sunday away from home. I’m sure other people manage quite fine. And so I’m going to work hard at hanging on to what I’ve managed this week and maybe taking a walk or actually exerting myself at the park. Something that burns calories. Sunday we’re all about attending services at the Church on 200 North 200 West in SLC. 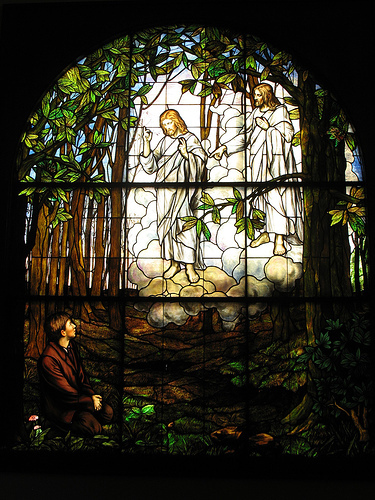 It has the most magnificent stained glass window of the first vision. There is plenty of folklore about it coming across the plains piece by piece — or from Europe — something amazing. Last year Tracy’s family ended up in a Russian speaking branch, just so they could attend church there.